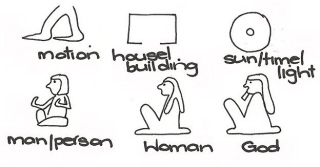 True Egyptian Hieroglyphs are based around pictures. But, other hieroglyphic styles developed simultaneously as a shorter, quicker, easier way to record information. As you can imagine, painting, carving or writing images--especially in colour--would be a very time consuming way of writing. The first shortened form was called Hieratic. This one was a cursive picture-less adaptation of the original. As it evolved further it became Demotic and finally, by the first century BE it was known as Coptic. One did not faze out the other, however, and could exist side by side on the same document. As was on the Rosetta Stone, which made it that little more difficult to decipher. * The alphabet - certain symbols relate to letters of the alphabet. Forget vowels, the Egyptians didn't seem to think them necessary, so the modern world had to kind of make that bit up for themselves. * Syllables - these symbols represent more than one letter at a time. These word signs are ended with a vertical stroke to identify them. Up, Down, left and right. Egyptian writing can be read left to right, right to left and stacked. There is an easy rule to remember in reading. Which ever way the animals or human characters are facing you read backward from there. When the characters are stacked you read the top first. This says temples and reads from left to right. This says Cleopatra and is stacked.